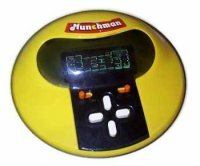 I remember getting the Grandstand Munchman game for Christmas one year, and spent most of that Christmas period playing it. The Nintendo Gameboy had yet to be invented, so portable games tended to be fairly large, requiring the massive C cell batteries to power them, and dedicated to playing a single game. That didn’t matter for Munchman, as the fact that I could take this game with me when doing the traditional family-visiting-the-relatives thing was a great advantage. It was of course a version of Pacman, which despite being played out on probably the smallest possible maze still had all the features you expected including dots, power pills, ghosts and even the fruit bonus (admittedly only a cherry was ever available, but it was there). The display was not LCD but one of those weird segmented light displays, a bit like one of those pocket calculators or early digital watches with the green or red numbers. Each square of the maze contained lightable elements for the dot or power pill, Munchman himself, and a ghost. You died if Munchman ended up in the same grid square as a ghost. This looked a little odd because the ghost could appear next to you both to the left and the right, but only when it was to the left did it register as being a kill. I can’t imagine a better design for this toy. It was circular with a bulge at the back for the display and was made from bright yellow plastic, with a transparent black plastic cover over the display. It kind of looked like a Pacman from the very start. Munchman was moved around the maze using four big white buttons, an on-off switch and a sound on-off switch. The latter was extremely important when playing it with other people in the room, as they soon got fed up of the shrill beepy rendition of the original arcade games music, and the odd gulping sound made by Munchman as he ate the dots. Grandstand also produced a pocket sized version of Munchman called, unsurprisingly, Mini Munchman. It had an LCD display and ran off one of those expensive flat cell batteries. A friend of mine had one, and while it was another great version of Pacman, being a Pacman purist I disliked it for replacing all of the dots with fruit. A minor point admittedly, but at the time it seemed important to me. The maze was printed permanently on the screen, with Mini Munchman, the ghost and the fruit being LCD elements. There were also the traditional looping tunnel exits at the top and bottom of the maze, which were sometimes unusable when an LCD bar appeared blocking them, just as you approached whilst being trailed by a ghost. This entry is filed under Toys - Videogames	and was posted on November 9th, 2007. You can follow any responses to this entry through the RSS 2.0 feed. You can leave a response, or trackback from your own site. The yellow game in the ad is Frogger. Well observed! Thanks matt74. 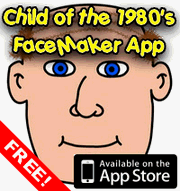 No wonder I didn’t recognise it, nobody I knew had that particular game when I was a kid. (In case anyone wonders what we’re on about, check out the video on my post about Virgin Atlantic’s 25th Birthday). I still have this. Played it yesterday, still works as well as the Grandstand space invadors game. I must get mine out of the attic and check it still works, if only to hear that great little piece of introductory music! I never ever played on this one. The only one I ever owned was Astro Blaster by Hayes or Hales?